Twin 1 1/4 SU's may not be a very good choice to be honest. You will probably see less power than your HIF is giving. The smaller twin SU's tend to be on the smaller bore A series engines. 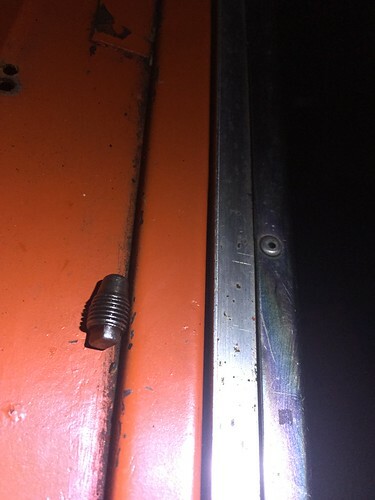 If you can, look for twin 1 1/2's or even a single 1 3/4" HS6 (older version of the 1 3/4" HIF). Trips - a crew competed on the 2015 or 2016 VoCC in a green 1275GT and finished well inside the top 10 and won their class with no trip. They just relied on stop watches and the cars inbuilt trip in the speedo. I'm not saying this way is ideal, but what I'm saying is for your first event, just going the correct way at roughly the right speed will see you get a half decent result and will take the pressure off the nav a wee bit. These events are hard on the nav, and even though the ToC is the best one to do as complete beginners to this sort of event, it is still a hell of a lot to take in. So what I'm saying is concentrate on the plotting side of things and get the team (you and GF) working well in the car and then throw in the average speed tables and trips etc. The 'modern' historic road rallies are a fairly new thing and nothing like the road rallies we used to do when the Mini was a current and new model. Now it is all about total regularity and short autotests tests. As some will know I always marshal on the Tour of Cheshire and the difference between the top crews who are on time at the secret regularity controls to within a few seconds early or late and the 'other crews' who are lucky if they even visit all of the controls is huge. A top crew will have a system for the navigation and time-keeping. The driving is the easy bit, but the navigator will need to stay on the correct route with absolutely no errors whilst checking the time against the distance every 1/2 a mile or so against the speed tables (typically the Don Barrow ones). Also, the average speed required will change during a given section from, say, 29.2 mph for the first 5.7 miles to 28.6 mph for the remainder of the section. So at 5.7 miles you must arrive accurate to the second and zero the trip and re-start the stopwatch at exactly that distance. When competing with my son navigating we always aim to run 5 seconds early, as you lose that slowing for a secret check. If the driver sees that he has a main road coming up where he must stop & give way, it is usual to accelerate to be around 10 to 12 seconds early as you stop, then after you have pulled away again you will be within a few seconds of the correct time/distance. For you first event just try to go the right way and don't worry about a few seconds of timing error. Just check the time/distance about every mile or so and if you are early leave it to the driver to 'lose' that earliness, or speed up a bit if late. Now on the tests the first thing is to be neat, go the right way around the cones/features, stop at any 'stop' lines accurately and don't hit any cones. The power of the car is not too important, but it must be reliable. Practice stopping accurately on different surfaces, as the penalty for overshooting a stop astride line is several seconds each time. The navigator and driver must have a pre-determined way of describing the way to go on the tests. For example, we use the same terminology for all tests which never varies. So I always know what I have to go and where in time to set the car up accurately. Anyway, it's great fun but the navigator must take anti-sickness tablets at least 1/2 an hour before the start. I can't over-stress this. And go out and practice, practice and practice together to develop your way of doing it. The navigator must use a system of giving route instructions and this must always be "distance, feature and any instruction" so, for example, "0.7 miles cross roads turn right, 0.25 miles junction on left turn left, 0.3 miles fork keep 45 degrees right, 0.4 miles road off left ignore it and go straight on". I hope this all helps and I'll see you on the ToC. at the 'Bickerton Poacher'. I'm ok with getting less power to be honest dave, as long as the car will carburate smoothly and cleanly on them then that's ok, however if you think that this may also be an issue then I will go looking for a single hs6, budget will not run to a pair of 1 1/2 su's at the minute. You are right we won't really know what we are doing with the trip and the avg speed changes etc but I think I'd like to have one in the car simply so that we get used to using it and get into the routine of doing the reset and restarting stop watches, if we can run within a couple minutes of ideal on each reg to start with ill take that, but I think that's a big enough ask. The ToC website has previous years reg instructions and the correct routes. I have had a go at plotting these and have them plotted about 90% right. Odd instances where I had gone a slight different route but essentially still got to the correct end, though I know this means we might miss an inter. Honestly if we can avoid getting towards being otl meaning we need to cut and run and miss a reg then I'll be happy. Communication in the car will be interesting haha honestly we just want to go out and have some fun, I really don't need another serious hobby, racing bikes has that covered and the gf events horses, so fun is the main aim, and it also ensures the car is used and not sat in a garage. That said I can't wait to get it mot'd up and running so that I can start using it. So, I am nearly back up and about, I am back at work but can only do so much physical stuff, so kneeling next to a mini on axle stands with my head in the arch isnt/wasnt a great way to spend yesterday, but thanks to a days holiday that what I did. So I wanted to get the cones swapped, main problem the compressor wont thread into the current cones as the threads are heavily corroded, so I took the shock off the front tie bar and the bump stop and then wound the hi-lo all the way down, and it just didnt quite clear so I had to take a pair of snips to the leading edge of the cup and trim it away to allow for enough room so that the knuckle could clear, not a major hassle, and I was replacing the cups anyway. Then I had fun and games, the cone was stuck, but once covered in plus gas an using a drift and hammer it dropped out of the subframe, now I have read that you can coax the cone out past the upper arm. BullSh17 you can. I spent about 5 mins looking at it and then decided even if you could (I maintain you cant) youd never get a new cone that hasnt been squashed a bit back in without taking the top arm off. I undid the rear bolt off the pin, then did the bolt nearest the wheel from the thrust plate but could get the the rear bolt, as much as I didnt want to I had to resort to bending the inner wing up and out the way a little. That done I the pin was easy to slide 2/3rdes the way out, but then it was getting stuck on something at the front end of the pin. I was hoping I could swivel out the arm enough to allow me to remove the arm from the pin with the top ball joint intact. As I had left the ball joint splitter at my dads. I gave it a try for a bit but wasnt having much luck so slid the pin back in and will take the top ball joint off this weekend and complete the passenger side with a bit of luck. No the shed where the car is, is about 50yards down the lane from the house, it has no power to it and no option to put elec into it. So my plan is to use my 5kva genny to power it. Ill put a RCD into it then run 2 ring mains one for lights and one for sockets, Ill put 3 double sockets into it although Ill prob only ever use one at a time but want to be able to move around the car an plug in easily. Lights I am just going to use 4 or 6 angled pendant bayonet fittings with 10w led bulbs in them. The spec says it needs a 6.45kva input to run, but having spoke to the guy from weldequipe he said that on the lower settings I will need then the welder will be fine from my 5kva. To be honest if I can do everything other than weld in the shed than thats fine as I can soon drive it the 50yrds across to my house and garage to do the welding. Now one thing I hadnt thought about when I bought this was that it becomes MOT Exempt as of May18, now I want to be using it before May, and even if I didnt Id not be using it till its been MOTd/checked even if it is exempt, but has anyone heard anything regarding insurance companies etc and their take on this? Edited by 28hodge, 16 November 2017 - 08:46 PM. There are always experienced navigators around to give advice the night before as well as any formal instruction. Come and find me if you need pointing in the right direction. The Bickerton Poacher is a great start/finish venue and the food is super. So with the other half and daughter away from Friday to Sunday I could get some bits done. The car is now sat on all four wheels with fresh front cones and hi-los all round, that done I then started to mock the seats up on timber to get a feel with where I wanted them and figure out a safe and solid solution for mounting the Cobra Clubman seats to the welded in seat rails. I also ideally wanted the driver seat on a adjustable subframe as my GF will be driving on some events, as I would hate to miss out on the opportunity to throw up trying to read maps in a moving car. She is shorter than me but luckily neither of use are either ridiculously short or tall im 6ft shes like 5ft4. In the end it was quite a simple fix. The mounting widths of the rails and the seats were different but the spacing between the mounts were the same front to back for both the seat and the rails/subframe rails. So I was able to chop the legs off a std subframe then weld a length of 1”x1” box to the bottom of the subframe and use that to pick up the welded in mounts and then drill the box section to allow me to bolt it onto the welded in seat rails. Biggest headache was checking and rechecking it was square and looking straight ahead, there will be enough motion sickness going on in the car without the driver feeling ill as well as they are sat slightly off square. It needs removing and fully welding up and I need some slightly shorter bolts which I will have to grab one night after work, but apart fromthat the drivers seat is sorted. Passengers I will just solid mount so just need a couple lengths of box to do that. That done i sorted out the roll cage door bars that came with the car and got them fixed in, to make sure nothing was going to foul with the seat mounting and subframe movement etc, all was good so the seat can be fully welded up now. Next was to start looking at the wiring, electrics not being my stongest subject! I started to look at the wiring for the external sockets I want/need. Whats in is ok but I’ll add some 12v sockets as they have been taken off the existing wiring. To that end I managed to score a bargain on eBay last night, won a Roamertime+ from the basic roamer company for less than £90 posted, happy with that so can now have a look at getting a sensor sorted for that to use. I have also been looking at their roamerlite C Potti, I like it as its battery operated so one less thing to potentially go wrong in the car. But that will have to wait till the new year. Next job is to replicate Rally1380 harness bar mount as mine currently uses mounts into the rear parcel shelf with spreader plates underneath, not ideal and as I have a new welder I want to do some fabricating. I was going to start it up get it out of the shed into the winter sum and get some pics, but the battery id had was goosed as was another I had kicking around. So I’ll have to get a fresh battery for it, I have had it running from jump leads previously but I need to get it mobile as I need to be able to take it across to the house and put it into that garage. I need some power to get a hairdryer onto the vinyl stickers that’s covering it as trying to take them off without is taking the paint with it, not great!! on a final note, i have booked accomodation for March 3rd just down the road from Beeston cattle market at a place i have stayed at before when racing at oulton, i did try to get accom in the Bickerton Poacher but its already full. Training day forms for the HRCR training with KDMC are printed off at home and will be sent as soon as i am paid. hopefully the car is up,running and fully legal straight after Xmas giving me a couple months to use it, i'll also need to swap the carbs prior to March though i think i lent my ultrasonic cleaner out so will need to retriev that i think first. Edited by 28hodge, 27 November 2017 - 03:56 PM. Sounds great 28hodge looking forward to the pics! The roamertime sounds a bargain, they are easy to use when you know how and the aftersales is great and very helpful if you ever get stuck. If youre on the road after Xmas, it's the Wirral to Llandudno run on the 7th Jan, might be a good day out to stretch its legs, I'll be there in my car giving it a run after the Xmas break! Phil from the Basic Roamer is a top guy and a good friend. £90 was a very good price!! So the roamertime+ landed in the post last night, with a bit of homemade electrical bodging, i got it up and running from a 12v car battery with inline 5amp fuse. all seemed fine until i turned it on in the Demo mode, where i couldn't get the unit to function in the forward setting (So the trips running forward) when plugged into the remote. It would run fine in reverse and pause reset the stopwatches etc fine, but it wouldn't run in the forward setting at all. unplug the remote and all seemed fine, so a bit puzzled i sent an email to the Basic Roamer Company at about 10pm not expecting a response but just so that i knew it was sent and would get dealt with in the morning. However Phil came back to me in 20 mins saying he would look into it on his test unit and let me know. Long and short after about 20 emails between us today he has suggested i send it back to him to have a look and he can rectify the issue for the cost of postage and if needed parts. Which considering i didn't buy the unit from them directly is really good customer service, so i can only recommend the Basic Roamer Company as that level of customer service doesn't really exist too much. I have also been looking at Carbs - looking at the twin HS2's that cam e with the car, they really need some stub stacks and filters, the current filters are just pods cable tied on and then stacks dont look great. ideally a NED ITg assembly would be good but I'm not too keen on buying this for the HS2's as they arent the ideal carb for the car really. so as i see it and as Dave said above 2 options really, buy a set of HS4's and then buy the MED ITG assembly, and then i would need a 1.5" manifold which makes me winch thinking of the cost, but i could sell the HS2's to compensate/offset that to an extent. Or as the Car already has a HIF44 i could (again as suggested by Dave above) just get a single HS6 and then get the MED ITG assemble for this and it'll bolt up to the existing HIF44 mainfold. these seems the simplest and easiets option, short of just bolting the HS2's on as is. And that is an option, peak performance from the car will make little difference to us to be honest, and i am not after pulling every single BHP out of it that i can as it'll be no use to us and make no difference to our results. What i do worry about is possibly pinking and going lean using the HS2's and this causing damage. Still undecided, it seems a bit daft not to try the HS2's seeing as i have them sat here, but like i say if there is the possibilty of causing damage then i wont bother. Any thoughts? And yes, i know i know, i promised pictures, i have failed! This weekend i will get some as i have a battery ordered for it!! Ok so I’ve kinda failed with Pics, but this wasn’t entirely my fault. I was stuck decorating, but I am sure you will all be pleased to know that we now have a lovely living room wall-papered feature wall, along with freshly painted and decorated everything else. Anyway, I did get Sunday afternoon with the mini, I had gotten a fresh battery delivered its an 075 but to be honest I’m not sure its 100% as it didn’t crank the car over all that fast? Anyway it did start it but I think I’ll be sending it back and exchanging it. The choke mechanism isn’t working 100% and it only had a couple litres fuel in it but I sat in it and kept it running for a while. I had a go at selecting some gears and it wasn’t happy bit of a crunch into reverse and stiff to go into 1st, so I’ll have a bleed up of the clutch and put some fresh fluid into it, the travel is really short on the pedal and feels like nothing is happening for the first 2/3rds of the pedal travel, without someone to watch the arm I cant be sure if its doing anything. I’ll bleed it up first and go from there. I then had a look at the choke mech on the Carb, its been bodged, the trunnion that should be there for the choke cable to pass through isn’t, the cable is fed through the choke bracket and then a cable connector block has been used to make a half arsed choke. So I’ve got a trunnion on order. Whilst I was on with this I found the rocker seemed a little loose despite the bolts being fully done up, so I whipped it off to see what’s what, and found that this is what’s what!! I promised pictures didn’t I!?! maybe not quite what you were looking for though! 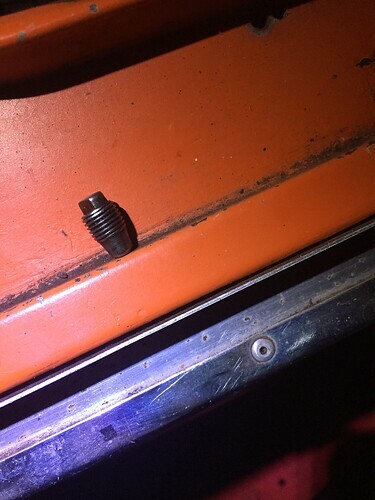 Yep that’s right the rocker shaft locating plug was loose in the top of the head! Great, I have had a look its not marked and I can’t see it having made contact with anything it shouldn’t but the rocker shaft has obviously been rotating/spinning inside the towers, not sure what effect this would have and damage this may or may not have caused. It does worry me though about the rest of the competency of the engine build. I am tempted to pull the head too at least have a look. That’s another reason why I am tempted to pull the head, but that got me to thinking that if I am going to do that do I pull the engine sent the short engine to be checked and refreshed, and also send the Gearbox to someone (possibly Guesswork’s) have that refreshed and then re install it all knowing that it is all good. Time and £ are the major consideration here as I want it for ToC in March and I want it MOT’d and to do some running with it prior to that to make sure its reliable etc. I also don’t own a engine hoist, so that would be additional £ though I am ok spending money on tools! Anyway on a positive note the Roamertime+ I sent back to Phil to have a look at is all ok, he has had to make a repair to the splitter as it was the cause of the problem, and looks like the previous owner had tampered with it and caused the issue, Anyway Phil has repaired it, FOC which is very good of him and then he’s gone above and way beyond what was expected by then also adding in the additional licenses that were not already on the unit, I really can’t say how pleased I am with that level of customer service. Edited by panky, 06 December 2017 - 04:43 PM.